Rawson Services, Charleston’s premier tree service provider, reminds you that there are pests aplenty that can do damage to your trees, including common critters known as Scales. But there are steps you can take to lessen their effects and, if necessary, contain and correct their damage. But first, an entomology lesson! Armored: the armor is a hard, lacquered covering they secrete to cover their bodies – but the armor is not attached. Armored scales are spherical in shape and do not move. Soft: These secrete a waxy film that IS part of the body. Soft scales CAN move, but rarely do. They can be spherical or flat. And soft scales produce a sticky-sweet substance (which ants LOVE) called honeydew. This honeydew can lead to the growth of sooty mold. 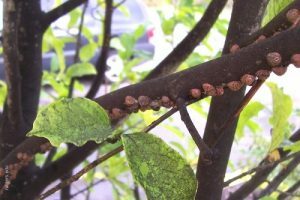 Sooty mold itself is not dangerous to your trees, but it looks awful! You CAN clean it off and you SHOULD, or else it can interfere with photosynthesis and healthy tree growth. Knowledge is key. Because they move rarely or not at all, you might mistake scales for some kind of harmless “skin condition” on your trees, instead of an active pest doing ongoing damage. You may actually see the damage they cause before you notice the scales themselves. So be on the lookout! Spot them and take action. If there are relatively few scales, you can brush or pick them off. 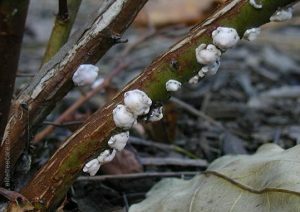 There are also chemicals that can remove scales from your trees. If the damage is too great, you may need to call Rawson Services to come and eliminate the damaged parts of the tree in order to save the undamaged parts. Tree Questions or Concerns? Call Rawson Services! Your trees are an investment; protecting that investment takes a sharp eye, the right tools, and expert assistance. In Charleston SC, you can count on the skilled, Certified Arborists at Rawson Services to deal with scale infestation. Contact us today for a free consultation and estimate!